Costa Rica is a blessed spot for experiencing nature in an unimaginable way. The country’s position is privileged to have a great percentage of World’s biodiversity (approximately the 5%) and, with this, the opportunity of host different species of animals living here, or are just passing by. In this case, we will talk a little bit more about the visit to Costa Rica of the big sea mammals: the whales. The biggest visit of this impressive animals usually occurs during the second half of the year, so now it is a great moment to spot families of these animals. But whales The whale watching season is an spectacle in many parts of the world, and Costa Rica is no exception. These incredible creatures come to our Pacific Coast looking for warm waters to mate and calve and now it is the whale watching Costa Rica best time to enjoy this spectacle. The warm waters and the tropical climate makes the country an ideal spot for these large mammals, due to their preference for the temperate waters located specifically at certain points of the coast, during this time of the year. There are various places where whales can be seen by curious and visitors, as these Costa Rica whale watching tours are an unforgettable experience offshore. The Pacific coast of Costa Rica is privileged thanks to its location in the country’s extreme south area. This region is visited by the migrating humpback whales that are travelling from the Northern and Southern hemispheres of the world during the season. Peninsula de Osa, in the southern region of the Puntarenas province, hosts a great population of whales for a pretty long time, due to the better conditions they find there. This event lasts several months which gives Costa Rica the opportunity to have one of the longest whale watching seasons all around the world. 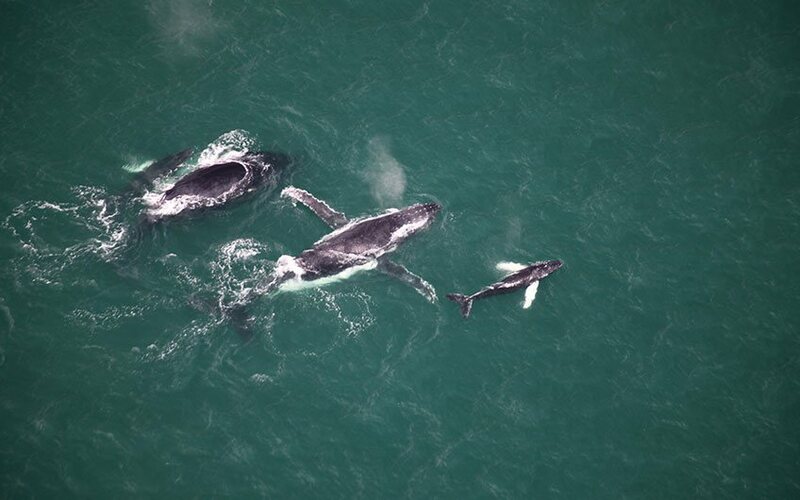 The Peninsula is home to more than just this kind of whales, there can be found over 25 species of these marine mammals either migrating or permanently living there. Spotted and bottlenose dolphins can be seen there too. That makes the region a must visit place during your family Costa Rica vacations as it will be an unforgettable experience suitable for all ages, both children and adults will be surprised and amazed by the beauty of nature. 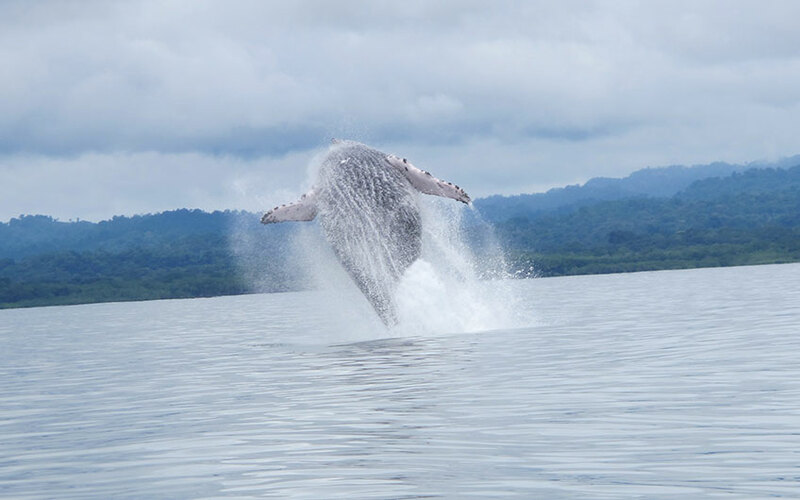 But not only in Peninsula de Osa you will be able to live the spectacle, you may know that other of the main places where whales can be spotted in Costa Rica is Bahia Ballena (Whale Bay), located in the South Pacific of the country, just south of the city of Dominical. That is the reason why Costa Rica’s government created there the Marino Ballena National Park, in order to protect this specie and some other ocean species such as dolphins, stingrays, turtles, and several species of sharks. But tours are not only limited to watch the marine wildlife, different kinds of birds can be seen too, and you surely will love the scenic beauty of the Costa Rica beaches, the forests, mangroves, and the coral reefs. When can be possible to do some Costa Rica whale watching? As we mentioned before, the humpback whale migrates to Bahia Ballena twice a year: from late December to late April, and from July to October. That’s the reason why every year, in September, is celebrated in this National Park the National Festival of Whales and Dolphins. During two weekends people can book whale watching expeditions and enjoy a lot of activities in the National Park surroundings. These activities can fit very well in many of our Costa Rica packages. Besides, people can have the chance to visit one of the main attractions of the Park: The Whale Tail. This is a rocky and sandy natural formation, shaped by the sedimentation carried by the tides. The Whale Tail can only be visited during the low tide, since at high tide it is covered by the water. Of course, the entire shape of the tail can only be seen from the air. Certainly, this National Park can be visited all year round; and the whale watching expeditions are also available before and after this National Festival. 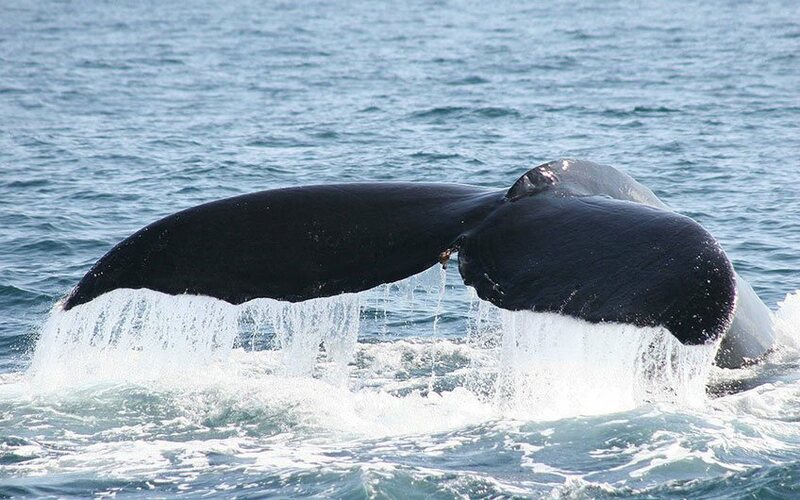 From July to September, the chances to see humpback whales in this area are really high. How to enjoy this season? Bahia Ballena, where the Marino Ballena National Park is located, it’s about 3 hours away from Juan Santamaria Airport. A beautiful road trip will take you from San José city to this beautiful beach area. Here, there are lovely hotels where you can stay. From luxury boutique hotels to more budget lodges, in the area there are plenty of options for everybody. Staying here 2 nights is recommended, in order to visit other nearby attractions such as Nauyaca Waterfalls or simply relax in one of the beautiful beaches around. The town adjoins the Marino Ballena National Park and the tours depart from there. The 90% of the local economy depends on the cetaceans and the rest of the marine wildlife. Due to this, the Association of Tour Operators in Marino Ballena National Park (ASOTU) always follow the stricter policies to comply with the regulations of the cetaceans watching; and of course, to promote different actions to operate into the most sustainable ways each one of the touristic activities. As examples of what they have done in order to reduce the human impact in these ecosystems, they change the engines of their embarkations to make them less noisy, at the same time they keep a close collaboration with scientists to plan and redefine the routes of the tours as a way to reduce the impact of the sea operations. Thanks to these efforts, the captains have reduced the fuel consumption and therefore, pollute less. Another of the sustainable practices they are implementing is the reduction of the plastic use in the area, this is still in process, but the local tour operators urge the visitors to carry their own water bottles during the tour and refill them using drums of water. Locals understand the importance of taking care of the wildlife and its habitat, as it is their main source of income. At the same time, they are trying to educate visitors during their Costa Rica whale watching tours, in terms of nature protection and sustainability, as a way to ensure that if they come to the region they will be caring about the conservation actions learned. 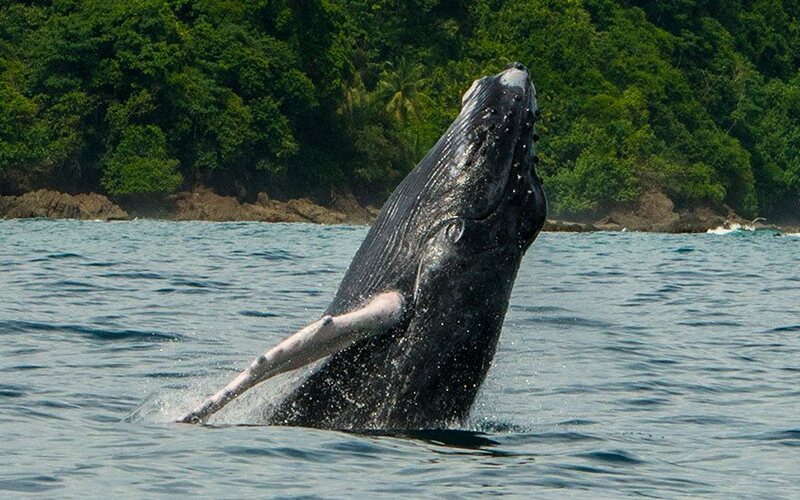 But this is not the only way to visit this region, if you are staying in the popular area of Manuel Antonio, you can book a one-day tour to Bahia Ballena to experience a whale watching expedition. From Manuel Antonio, a road trip of 1 hour approximately will take you directly to Marino Ballena National Park. And, to get to Manuel Antonio from San José Costa Rica you can make a road trip of 3 hours, or you can take a local flight of 25 minutes approximately. Where else you can see whales in Costa Rica? As we mentioned, Bahia Ballena is not the only place in Costa Rica where you can spot whales. Drake Bay, also in the South Pacific of the country, is another good point for this activity. In this place, whales from both poles meet up there for mating, giving birth and looking after their babies. The whale season here is almost the same as in Bahia Ballena, from late August to late November. This means that you can combine both destinations and have more chances to see these beautiful creatures during your Costa Rica vacations. Also, there are some whales that visit the dome located in Golfo Dulce to feed and reproduce. That’s the case of the Blue Whale, the largest animal on earth. But the species that visit this region, only pass through the country and are deep water dwellers, which make it harder to be seen. Most of the lodges of these areas offer whale watching tours combined with dolphin watching, snorkeling time or fishing. You just need to contact us and ask for the ideal tour that fits better into your Costa Rica vacations package and we will be more than glad to assist you. It’s very important to know that rainy season in Costa Rica goes from May to November. This means that during the whale watching season, is also rainy season. Probably you will have to experience some rainy days in paradise, but that’s good news! because it means that most of the hotels will have lower rates and promotions, due to the low season. You can take advantage of these promotions during your Costa Rica vacations and also enjoy of one of the most beautiful spectacles of nature if you decide to visit the country during the Green Season. Travel tip: It’s very important to take into account that sea sickness can also be present in this kind of tours. That’s why we recommend you to take with you some medicines in case you start feeling dizzy or nauseated, especially when traveling with children. Your Costa Rica family vacations must be relaxed and quiet. After taking this tour, you will agree with us in the fact that none should miss this experience!